Seamless flight planning for commercial drone projects. Flyte is a drone flight planning and operations management software company currently serving the commercial drone sector around the globe. Currently based in Belfast, Northern Ireland, Flyte was founded in Spring 2016 by geospatial tech enthusiasts, Matthew Bradley and Kerr Mackinnon. In October 2016, they launched a light version of Flyte as an inaugural app within the DroneDeploy App Market and by March 2017, the first version of their flight planning and operations management platform was rolled out with pilots operating around the globe taking advantage of early-bird discounts. 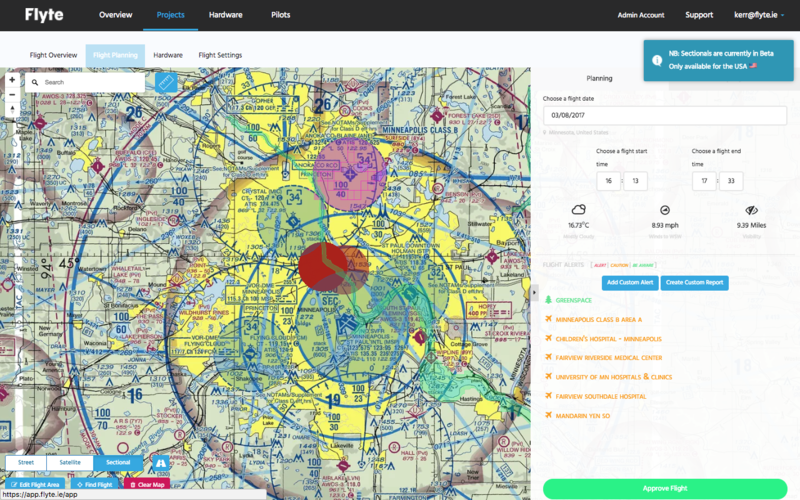 Flyte provides pilots with global airspace and ground hazard data through comprehensive mapping Powered By AirMap. The system built on top of MapBox, allows pilots to easily interact with airspace and hazards, resolving issues, logging flight and hardware data and creating digital records. Ultimately, Flyte optimizes pilots’ drone operations in terms of both safety and professionalism whilst removing complexities associated with current drone flight planning methods, giving pilots more time in the air. The current version of Flyte gives pilots full fundamentals for pre-flight planning within an easy to use, seamless interface. The in-flight app and post-flight capabilities will be released over summer and into autumn. Within the Flyte application, the sectional charts are neatly punctuated by the airspace and ground hazard datasets. With both, you are able to intuitively click on areas of airspace within the sectional chart and then supporting information, such as TFRs or ATC contact details are provided through the digital airspace data. This not only enhances the flight planning process, but then automatically takes the information from within the sectional chart and places it within the auto-generated flight reports. Flyte is currently developing their mobile app which will log live flights back into their users’ accounts removing the need for manual logging. This application will capture all technical hardware data detailing the health of the drone, operations management data such as which pilot flew which drone when and where, log additional hazards once in the field, provide offline flight logs, live weather and maps. As more industries worldwide adopt and scale their drone technology as part of their day to day operations, drone pilots will require better solutions such as Flyte to maintain operational records and overall safety and compliance. These features, among others will each be available within the Flyte Mobile App; more news to follow on that imminently — www.flyte.ie. To try Flyte, a 30 day free trial can be accessed at https://app.flyte.ie/get-started. To learn more about Flyte’s integration within the DroneDeploy App Market, visit https://support.flyte.ie/offers/dronedeploy.